Environmental Resource Centero three software packages, the ISO 14000 Compliance Software enables the user to implement, audit and asses an Environmental Management System (EMS). The Assessment Software allows you to perform gap analysis of an EMS by completing a series of integrated and interactive checklists covering every requirement of ISO 14001. 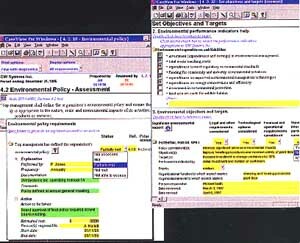 Reports are automatically generated that detail the assessment results. The Implementation Software assist in implementing an EMS that meets ISO 14001 and contains all the components of the assessment software plus implementation worksheets that guide the operator through each step of the process. Auditing an EMS for registration or self-declaration to ISO 14001 can be done through the ISO 14001 Audit Software. This software is designed for both internal and external auditors performing an ISO 14001 audit. It consists of a comprehensive set of audit procedures designed to test every ISO 14001 requirement, then automatically generate a customizable audit report.